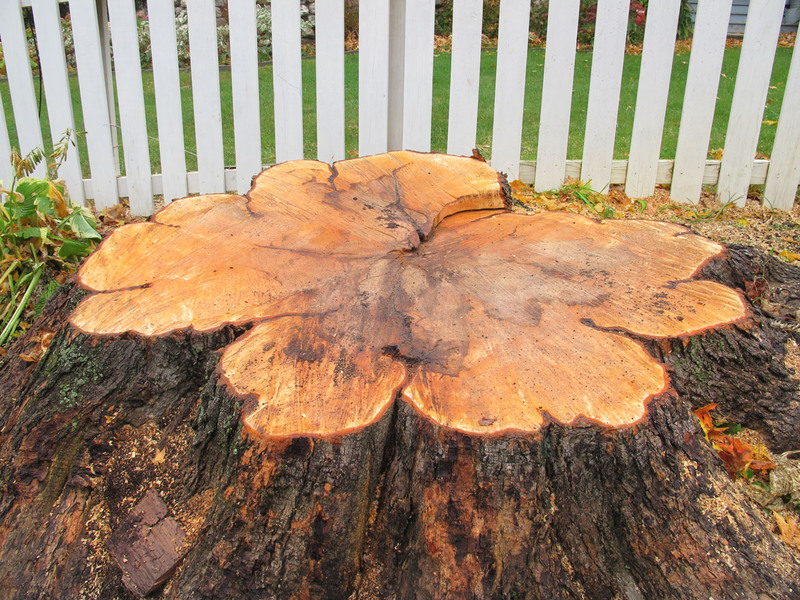 Tree Cutting: I Think That I Shall Never See…. 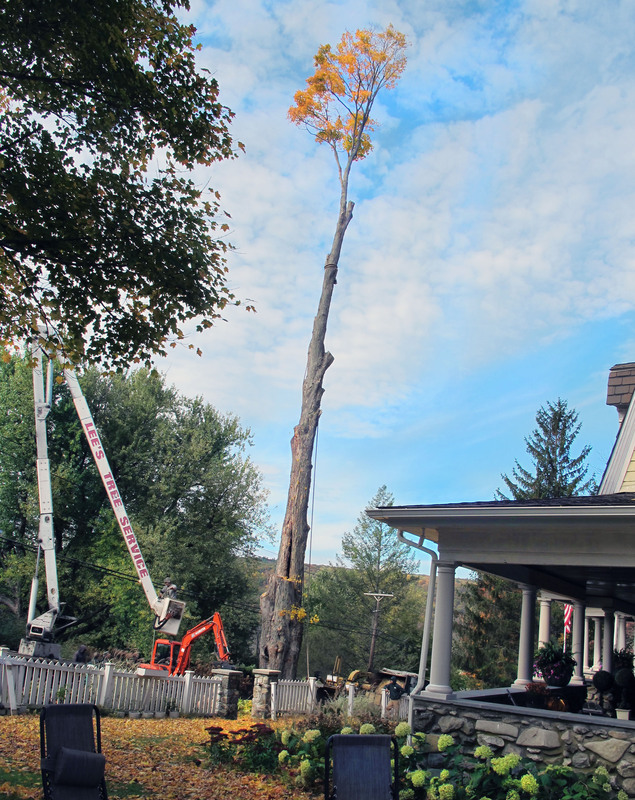 My heart is broken for the loss of our 100+ year old tree that the town of Amenia determined needed to be taken down. 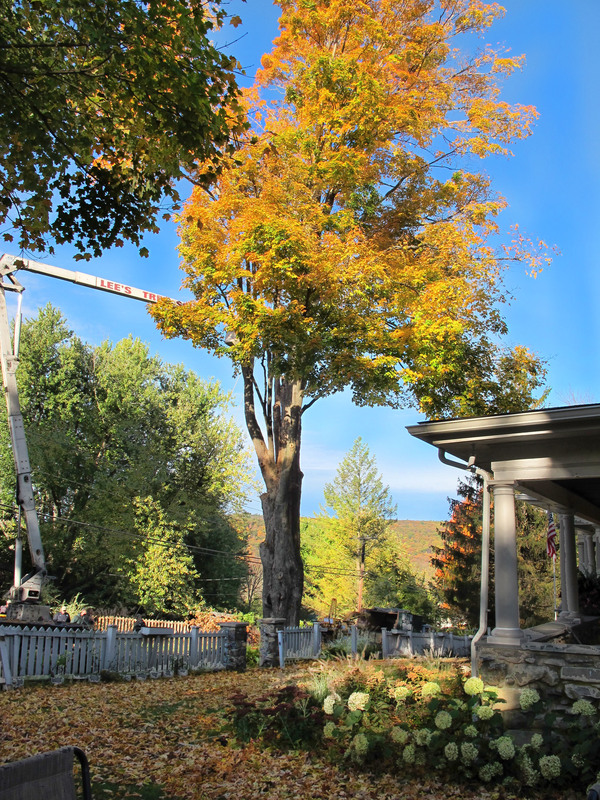 The big ole maple had split over the years and was cabled prior to our purchase of the Hilltop House Bed and Breakfast, and eventually discovered that there was a huge hole in the center where the split was. I’m going to warn all of you tree-huggers out there that this is a sad post, so if your emotional content meter can’t take it, don’t read any further…….The town advised–putting it nicely–that it really should come down; it was only a matter of time before it fell. So sad that it happened in the fall, with all the festive fiery finery on its branches. The pictures tell the rest. 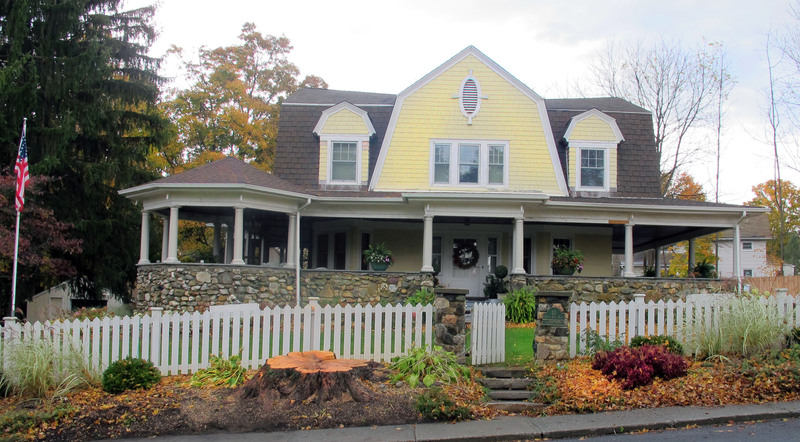 Now Hilltop House looks so empty and different without that beautiful tree out front. You would have never known by looking at it because that beautiful tree looked healthy and full of green leaves. Mature trees are a big part of what makes an older neighborhood so charming and desirable. 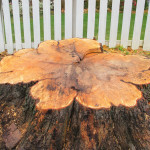 Now I’m wondering what I’m going to do with the big stump left in it’s place. For history buffs who follow us: You know we love servicemen and trees. Just a note on Joyce Kilmer who wrote the poem “Trees,” from whence we stole the title of this blog. While many found the poem he is most known for as simple, the man was not simple at all. A father of five; one of his children died of infantile paralysis or polio. Kilmer died in World War I at the age of 31 in 1918; he was a sergeant with the Fighting Sixty-Ninth! And while he could have accepted a promotion to a safer job, he turned it down to stay in the trenches, working finally in intelligence. Kilmer was buried in the Oise-Aisne American Cemetery , near Fere-en-Tardenois, Aisne, Picardy, France. 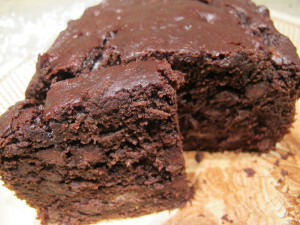 I was tired of throwing out overripe bananas all the time, so I did a search for chocolate banana bread. I’d never had any before and am not a fan of chocolate chips in regular banana bread………..BUT OH. MY. GOSH!!!!!!!!!!!!!!!!!! I am addicted to this. I don’t know what it is about the combination of chocolate and bananas, but it packs the most insanely intense deep chocolatey burst of wonderfulness that I just keep making it one loaf after the other. As goodies go, it’s not that terribly awfully bad for you. (Great three negative words to describe something positive!) Only 1 cup flour and 3/4 cup sugar in the loaf…. not counting the choc chips.